The Droid officially arrives Friday, sporting a 3.7-inch screen with a width of 843 pixels and a quick TI OMAP 3430 processor. It costs $199 with a two-year contract. The device is slightly thicker than an iPhone 3GS, and comes with a physical slide-out keyboard. Verizon and Motorola have targeted the iPhone with an advertising campaign comparing the Droid to the iPhone. With a style and accompanying song set to parody Apple's own ads, the commercial ran a list of things the iPhone cannot do, with the tag "iDon't." The advertisement attacks the iPhone's lack of a physical keyboard, inability to multitask with third-party applications, and absence of a camera flash. Tension has built between Verizon and AT&T in the weeks of buildup to the Droid launch. Last month, Verizon began running a series of ads lampooning Apple's famous "there's an app for that advertisements, by declaring "there's a map for that," comparing the two devices' coverage maps. This week, AT&T filed a lawsuit against Verizon over the campaign, alleging that the coverage maps shown are deceiving for viewers. Reviewers like the Droid, saying it's a good handset and likely the best smartphone Verizon has to offer. Whether it's better than the iPhone, though, seems to come down to a matter of taste. 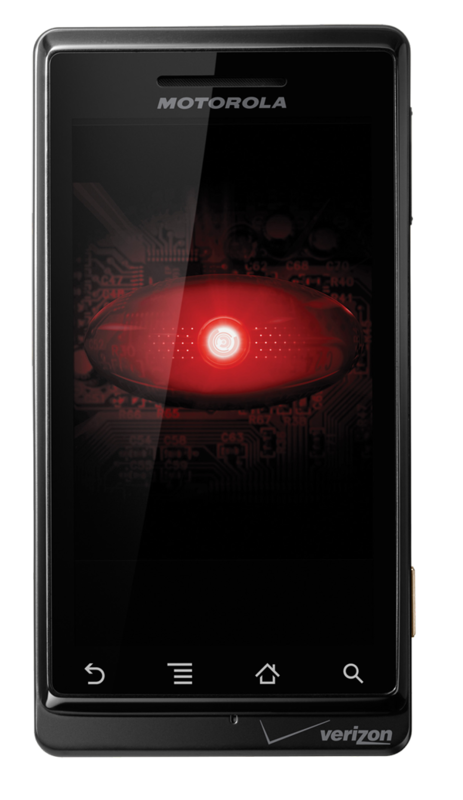 The Droid is the best smartphone on Verizon, the best handset from Motorola and the best Android phone. "I can recommend the Droid to Verizon loyalists who have lusted for a better smart phone, but don't want to switch networks." Android 2.0 is an improvement, most notably the free Google Maps Navigation turn-by-turn directions. The 3.7-inch screen looks great, but lacks multi-touch and is not as responsive as some other hardware. The keyboard is "awful" and causes frequent typos. The software doesn't include an auto-correct feature for the physical keyboard, yet the on-screen virtual keyboard does correct typos. Android still only has three panels for displaying apps, versus 11 on the iPhone. "The Droid is potentially a big win for Verizon, Motorola and Google, as well as for loyal Verizon customers." "The Droid wins on phone network, customizability, GPS navigation, speaker, physical keyboard, removable battery and openness (free operating system, mostly uncensored app store). The iPhone wins on simplicity, refinement, thinness, design, Web browsing, music/video synching with your computer, accessory ecosystem and quality/quantity of the app store." New multi-function handsets need to be called "app phones," distinguishing "iPhoneish" phones from "mere smartphones." The Droid has a "masculine" design. "Is the Droid an iPhone killer? No, but it's certainly a killer phone." It's fast, audio quality is great, and the screen is "gorgeous." Though the Droid is only slightly thicker than the iPhone, the iPhone tapers off with its curved edges, so it feels much thinner in your hand. The Web browser is good, but slower than the iPhone and hurt by a lack of multi-touch for zoom. Android's 12,000 apps don't compare to the more than 100,000 available for the iPhone, which are largely "more useful and imaginative." "The Droid stands out from a crowd of iPhone wannabes." Google Maps Navigation worked well on a late-night ice cream run, with the phone in a pocket and the volume turned up on a motorcycle. Voice search is nice, but not perfect. "I'll probably stick with using the Droid's keyboard to get directions." Android 2.0 and the Droid multi-task well, but not perfectly. "I tried to make a call while the Maps Navigation application was running and had to endure very loud instructions about where to turn while the phone was ringing." Verizon's network is strong and gets solid reception without dropped calls. "Even if you aren't already using Verizon, if you're not swayed by the iPhone, you might fall for the Droid. "Will the Android Marketplace catch up to the iPhone's App Store? Therein lies the key to success for the Droid. The Droid certainly lives up to its promises and does a lot of things the iPhone doesn't. The iPhone will probably keep its smartphone throne for now, but it will have to deal with a powerful new competitor." The hardware has a "solid feel and heft —there's alot going on behind the crisp, 3.7-inch touchscreen." The keyboard is "shallow and flat," and typing is uncomfortable and difficult. "The Droid is also missing physical Talk and End keys, which are pretty much standard on every other cell phone ever made. You must access these controls from the call application." Call quality is excellent, even in a noisy area. The hardware comes with a number of installed applications, but lacks Verizon's V Cast streaming video and entertainment services. Outdoor shots on the camera looked great, but indoor pictures were prone to graininess. The phone's dual-LED flash tends to distort colors. Other reviews are available from Gizmodo, Engadget, CNet, and MobileCrunch. And for a rebuttal of the Droid "iDon't" commercials, read the latest column from Andy Ihnatko of the Chicago Sun-Times.